Andrea (“Annie”) Daigle joined the violin section of the Louisville Orchestra during the 2016-17 Season. 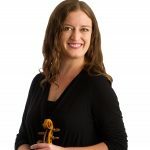 Prior to her move to Louisville, she spent four years as a fellow at the New World Symphony in Miami following six years at the Cleveland Institute of Music. She earned both her Bachelor and Master of Music degrees in Cleveland, where her primary teachers were David Updegraff and William Preucil. During her tenure with the New World Symphony, Ms. Daigle appeared regularly in small ensembles and in principal positions within the orchestra. She was also featured as a soloist performing the finale of Mozart’s Sinfonia Concertante at the 2016 New World Symphony Gala. After completing her fellowship, she spent four months traveling the Mediterranean as a member and manager of the Eurodam Quintet for Lincoln Center Stage. Daigle enjoys the opportunity to perform in different settings during the summer months. During summer 2017 she performed in the Artosphere Festival Orchestra, the Britt Festival Orchestra, and as Assistant Concertmaster on the 2017 New York Symphonic Ensemble’s tour of Japan. Previous summer activities include several seasons at the Tanglewood Music Center and Spoleto Festival USA.